New Delhi [India], Nov. 23 : The allegations of ball tampering leveled against Indian Test skipper Virat Kohli by a British tabloid did not hold much ground as per the specific clauses in the International Cricket Council's (ICC) Rules and Regulations about playing conditions. After the 'mintgate' row involving South Africa skipper Faf du Plessis in which he was found guilty of ball-tempering, a British tabloid had yesterday accused that some footages of the Rajkot Test indicated that Kohli appeared to shine the ball using residue from a sweet. However, the England team have not filed any complaint and have also declined to comment on the issue. Rajkot [India], Nov. 9 : Brimming with confidence after a 3-0 clean sweep against New Zealand, India would look on take revenge from England for the last three series defeats it faced against the same opposition when the two teams face each other in the opening match of the five Tests series starting from today at Rajkot, which is a debutant as the Test venue. After their triumphs over West Indies and New Zealand the morale of Team India, which is also ranked World No.1 now, is high. On the other hand, the current No. 4 ranked England are coming from a recent Test defeat at the hands of Bangladesh. It would be a big task for Alastair Cook to re-instate the confidence in his team when they would take on the No.1 Test side, that too in their den. 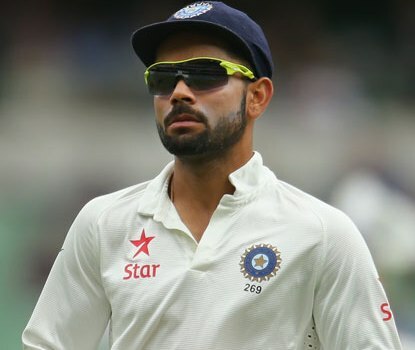 Will India take revenge from England courtesy Kohli's aggression? New Delhi [India], Nov. 8 : With just a day left for the much-anticipated five-match Test series between India and England, all eyes would be on the new aggressive skipper Virat Kohli to see whether he can motivate his boys to take revenge from the Alastair Cook led-side for the last three series defeats. It is after quite a while that India are playing a five-match Test series at home. Having already started the home season on high with a 3-0 clean sweep of New Zealand, anticipations and hopes would be at the paramount from the hosts who topped the ICC Test rankings displacing Pakistan from the coveted position. Indore (Madhya Pradesh) [India], Oct.7 : While praising Mohammed Shami's stunning comeback from injury, Indian Test skipper Virat Kohli on Friday admitted the former is a very important bowler for the team who makes it count every time he comes on the field. "Shami is someone who has comeback very well. He worked really hard on his fitness as well. You can see that he is able to bowl 5-6 overs a spell now in heat," Kohli said on the eve of the third Test against New Zealand at the Holkar Cricket Stadium here. 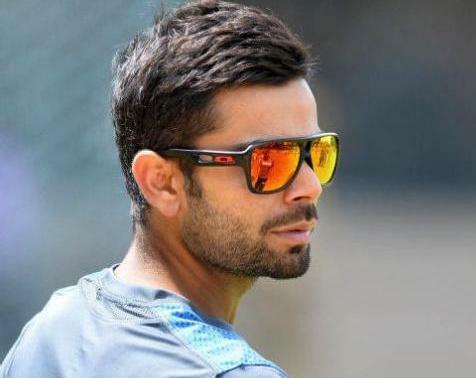 New Delhi: Star batsman Virat Kohli on Friday became the second most followed Indian sportsperson on 'Facebook' behind iconic Sachin Tendulkar as he crossed the 20-million mark, the social networking site said. 26-year-old Kohli, the first Indian batsman to score a century against arch-rivals Pakistan in a World Cup match in the 76-run victory on February 15, currently has 20,002,000 followers on Facebook. He is the second Indian sportsperson to cross 20 million benchmark behind Tendulkar who currently has 24,775,138 followers. Globally, Kohli is listed at 20th position, while Tendulkar occupies 13th spot in the list of sportspersons who have maximum followers on Facebook. Sydney: Three days after India captain MS Dhoni surprised the cricket world with his sudden retirement from Test cricket, the focus is slowly shifting towards the new skipper and how India would make a fresh start with Virat Kohli at the helm when final Test commences here on January 6. With Dhoni opting to stay away from not only the cricket field but also off it, as he didn't attend the high-tea organised on Sunday by the Australian Prime Minister Tony Abbott for both the teams, Kohli has been hogging all the limelight. Dhoni's retirement technically means he is no longer a part of the Test squad, but he was invited nevertheless. London, Dec 29 - Star Indian batsman Virat Kohli has slammed Australia's sledging, claiming that he had no reason to respect their pace spearhead Mitchell Johnson and insisting that the hosts' players called him a spoilt brat. Kohli, who scored 169 on the third day of the third Test during which he and Johnson exchanged plenty of verbals, claimed that the Australians were calling him a spoilt brat, adding that he said, that maybe that's the way he is; they hate him, and he likes that. Kohli said that it apparently worked in his favour, as the batsman has hit three centuries in the series but India are 2-0 down in the four-match series, the BBC reported. Adelaide (Australia), Dec 11 : Virat Kohli on Thursday became the third cricket player in Test match history to score a century on his debut as captain. Kohli notched up his seventh century in his 30th Test. At the time of the filing of this report, he was batting on 107 of 164 balls with twelve hits to the fence. 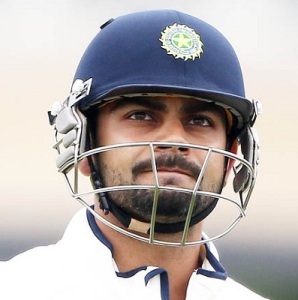 Kohli's ton has helped India give a strong reply to Australia's first innings total of 518 for seven declared. At the time of the filing of this report, India were sitting pretty on 346 for the loss of four wickets off 87 overs, but are still trailing Australia by 171 runs. 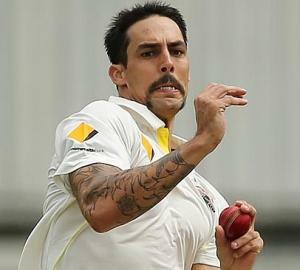 Sydney, December 11 - Australian pace spearhead Mitchell Johnson's bouncer delivery that hit Virat Kohli on the helmet appeared to have shaken up both players, while sending shudders around Adelaide Oval shortly before lunch on the third day of the first Test against India. The stand-in India captain Kohli, who was facing his first delivery, came out unhurt as it was hit on the badge of the helmet. However, a genuine concern was displayed by the Australian players, who immediately rushed towards the player to ensure Kohli wasn't injured, News. com. au reported. Sydney, Mar 29 - India has sailed into the semi-finals of the World Twenty20 tournament following an eight-wicket victory over hosts Bangladesh in Dhaka on Friday. Leg-spinner Amit Mishra, who was the Man of the Match in both the previous wins against Pakistan and the West Indies, continued his impressive form with 3-26 as Bangladesh was restricted to 7-138 in the Group Two match of the Super-10s. Sydney, Mar 22 - Pakistan has failed to break their World Cup jinx against arch-rivals India, which defeated them by seven wickets in their opening World Twenty20 clash on Friday in the Super-10 round at Dhaka. Leg-spinner Amit Mishra grabbed two wickets for 22 runs in four overs while Shikhar Dhawan and Rohit Sharma gave India a flying start with a 54-run opening stand in eight overs as Mahendra Singh Dhoni's men surpassed the modest total of 7-130 with nine deliveries to spare at the Sher-e-Bangla stadium. Aamir Khan, Virat Kohli EC's 'national icons'? New Delhi, March 10 : The Election Commission is likely to appoint Bollywood actor Aamir Khan and cricketer Virat Kohli as "national icons" who would encourage more and more people to vote in the general elections. Aamir and Kohli are expected to join the league of four other "national icons" - cricketer Mahendra Singh Dhoni, boxer M. C. Mary Kom, badminton ace Saina Nehwal and former president A. P. J Abdul Kalam. New Delhi, March 4 : A series of losses overseas for Team India saw skipper Mahendra Singh Dhoni's popularity taking a hit on internet and Virat Kohli's fan following rising. A study by search engine Google showed that Dhoni's last minute withdrawal from the Asia Cup and Kohli's century as a captain has impacted the ranking of these two cricketers on Google Search Trends. While Kohli ended 2013 with more endorsements than Dhoni, a search trend analysis over the past 30 days revealed how online search on Kohli is on the rise leaving the popular Dhoni at second spot. Dubai, Feb 19 : India's Virat Kohli has moved up two places to a career-best ninth position in the latest ICC Test batsmen rankings released Wednesday, breaking into the top-10 for the first time in his career. His rise came following the knocks of 38 and 105 not out in the Wellington Test against New Zealand which ended Tuesday. Kohli joins seventh-ranked teammate Cheteshwar Pujara as the only two Indian batsmen inside the top-10. Pujara, however, has dropped a place after Pakistan's Misbah-ul-Haq overtook him in the charts. Mumbai's Ajinkya Rahane also showed remarkable rise, leaping 15 places to 46th. Islamabad, Nov 19 : Indian batting star Virat Kohli and South African ODI captain AB de Villiers are reportedly locked in a battle for the number-one batting position on the ICC Player Rankings for ODI batsmen. With only eight rating points separating number-one ranked Kohli from de Villiers, the forthcoming series between South Africa and India offers both of them with an opportunity to either retain or reclaim the top position.